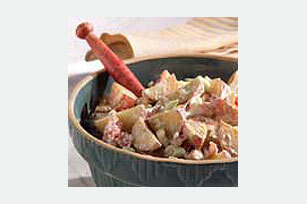 Transform everyday potato salad into something extraordinary with Roasted Potato Salad. The extra step in making Roasted Potato Salad is really worth it. Preheat oven to 425°F. Place potatoes in 15x10x1-inch baking pan sprayed with cooking spray. Bake 30 to 35 minutes or until potatoes are tender and golden brown, stirring after 20 minutes. Mix dressing, bacon, eggs, onions, salt and pepper in large bowl. Add potatoes; mix lightly. Serve warm or chilled. Store potatoes in a cool, dry well-ventilated place away from light. Never refrigerate them as the cold temperature converts the starch to sugar and affects the taste. Makes 8 servings, about 1/2 cup each.